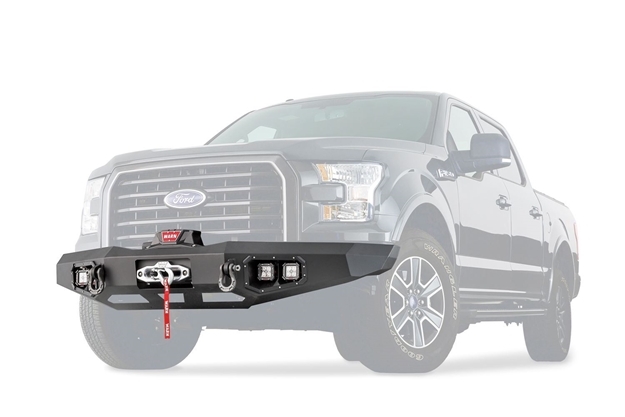 Ascent Front Bumper for Ford F-150 - 100915 | WARN Industries | Go Prepared. The Warn Industries Ascent Bumper is made from textured black steel and is direct fit. It is a one piece design that includes D-ring mount and winch mount. NOTE: May interfere with Driver Assist Software. When a WARN Ascent Bumper rides up front on your full-size truck, you open up a world of possibilities. You get the look you want, the rugged functionality you need. Precision angles and a unique low-profile design maximize approach angles and optimize off-road performance. Plus, the WARN Ascent Bumpers come ready to fit the legendary WARN mid-frame winches - like the ZEON Platinum and a host of others. When it comes to integrated style and functionality, there's nothing else like it, not even close.